This girl is growing and filling out starting to look all grown up...by this fall she is going to be ready to start...Streakin Licious yearling filly by Streakin Again and out of Hancock Deb nice producing Mare. Streakin Again LTE 65000.00 paid in full to Future Fortunes. This filly is sorrel roam throughout strong bones built to take a job she has great confirmation very correct straight. Streakin Again is producing offspring that are making a name in the futurity competitions as well as professional level. This filly is a smooth mover very athletic she handles herself very well. she is developing a very fun personality. Currently learning to stand tied, has had feet trimmed handles that well, loves to be groomed I have been amazed at these colts by Streakin Again they absolutely want you to do something with them she is no different. 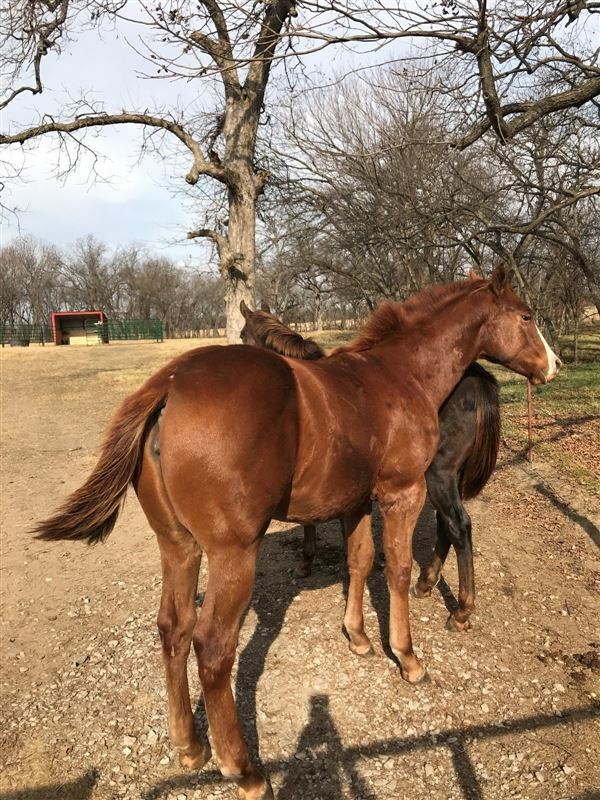 This filly will make you a great futurity prospect then she will make a nice big broodmare for the future I am keeping her 3 year old full sister and plan to futurity her...they are identical just love the 3 year old ...we will turn this filly out till fall if she doesn't sell and start her training her price will go up according get her while you can at this price she is a big girl and will be ready to start.